McCool Junction, with a population of 372, is a thriving town filled with working class individuals who are proud of their community, their school and their way of life. 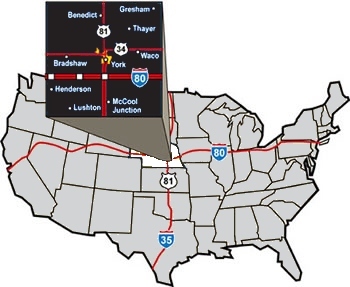 McCool Junction is located along Highway 81, a four-lane expressway, five miles south of Interstate 80 in southeast Nebraska. We are located 5 miles south of York, 48 miles east of Grand Island, and 55 miles west of Lincoln. The first settlers arrived in 1867 and filed homestead claims along the river. The first town platted was known as “Niota”, which is now the southern part of McCool Junction. A new village was platted in late 1886 and with that transaction, Niota lost not only its town site but also its name. Renamed for the promoter and general manager of the St. Joseph and Grand Island Railroad, Daniel McCool, the new village was registered as “McCool”.